This Play Craps Quiz at gamerisms will test your basic knowledge of numbers, strategies plus craps lingo for this international casino game. Can you hear the roar of the crowd? That’s the sound of excitement at the Craps Table. Are you ready to lay that bet as we begin this Craps Quiz? 1) What are the spots on the craps game dice called? 2) What is the name of the bowl on the craps table that is used to hold the dice? 3) What are Point Numbers in Craps Games? 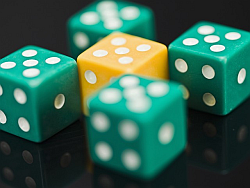 4) What is the total number of combinations that a pair of dice can be rolled? 5) When craps players first roll the dice, it is called? 6) When can you make an Odds Bet at a craps game? A. After the Come-Out roll. B. After a Point is established. C. After the Pass Bet. 7) What does the term Wrong Bettor mean in Craps? A. Player who bets The Horn. B. Player who bets Don’t Pass/Don’t Come. C. Player who bets the Big 6 and 8. 8) What do craps players mean with the term Hook? A. Imaginary line that separates players 3 and 4. B. Device used by the Stickman. C. The combination of 3 and 4 on a dice equaling 7. 9) What does the term Barefoot Bet mean in Craps? A. This is a Pass Line Bet only. B. This is a Come, Pass Line or Don’t Pass Bet without any odds. C. This is a Don’t Come or Don’t Come Bet only. 10) What do craps players mean with the term Big Red? A. Refers to the Big 6 and 8 on the table layout. B. Refers to the pair of dice. C. The dice are showing a seven combination. Answers to Play Craps Quiz. Was your roll of the dice a success? 1) B. They are called pips, but if you call them spots or dots, don't worry, the dealer will still take your bets! 2) C. It is a dice boat, because the original wooden containers looked more like small boats than bowls. 3) A. Point Numbers are 4, 5, 6, 8, 9 & 10 and these points, must be repeated before a 7 is rolled. 4) B. There are 36 combinations a pair of dice can be rolled. The 7 can be rolled in six combos; that’s the highest combination probability. The 6 and 8 can be rolled five combos, the 5 and 9 can be rolled four combos, and the 4 and 10 can be rolled three combos each. 2, 3, 11 and 12 make up the balance of the combos. 5) B. When a player first rolls the dice, this is called a Come-Out. 6) B. This odds bet is made only after a shooter has established a point. 7) B. The Don’t Pass/Don’t Come bets are easily recognized on the table layout. These are called wrong bets, but they still keep you in that low 1% casino advantage range. 8) A. Hook: imaginary line that separates players 3 and 4 or on larger tables, players 4 and 5. It dictates where the dealer will place the players’ Come, Don’t Come, Place, Buy or Lay Bets and helps to eliminate misunderstandings. 9) B. Barefoot Bet: This is a Come, Pass Line or Don’t Pass bet without any odds. 10) C. Big Red: The dice are showing a seven combination and perhaps a pocketful of cash for you! What is the worst bet in Craps? B. The house edge on buying the 5 and 9 is 4.7%. Laying the 5/9 is 3.2% and placing the 5/9 is 4.0%.